When Will I Get My A9 Envelopes? 5,000 and under A9 Envelopes: Ships or ready for pick up in 2 business days from proof approval. Over 5,000 A9 Envelopes: Ships or ready for pick up in 5 business days from proof approval. When you want your invitation or announcement to have a sizeable impact, deliver it in our printed A9 envelopes. Choose 48HourPrint.com for high quality A9 envelope printing that gives you more for your money. Our reliable online envelope printing services deliver big on quality and savings, so you can be sure you’re receiving the best value. Printed A9 envelopes are well-suited for mailing larger invitations and announcements. Select our A9 envelope printing to give your invitations or announcements the introduction they deserve. 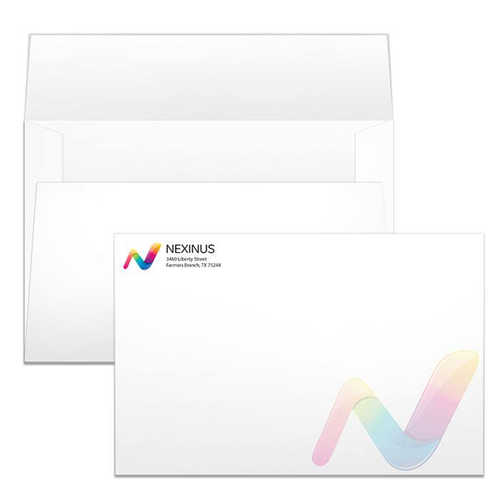 These 5.75” x 8.75” A9 envelopes emblazoned with your full-color logo, address or a sneak-peek message will get people opening your envelopes right away. You can also include our printed A6 envelopes or A7 envelopes with response cards inside our A9 envelopes. In addition to A9 envelope printing, our online envelope printing services include #10 envelopes, #10 window envelopes, #9 envelopes, A2 envelopes, A6 envelopes, A7 envelopes, 9x12 envelopes, and 10x13 envelopes.